Hanging Kits with chains give you a very strong support for your banners or posters. Our complete kits contain everything you need for any type of ceiling mounting. 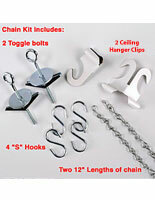 Each kit contains (2) lengths of chain, (4) "S" hooks, (2) Barnacle Clips for drop ceilings, and (2) toggle bolts for sheet rock or plaster ceilings. Varying lengths of chain are offered to allow you to hang your images as close to, or as far from the ceiling as you would like. Ceilings are ideal space to advertise to keep graphics out of the way of priceless floor space. Turn your poster or banner frames into a ceiling hanging display! Displays2go is one stop shopping for all of your point of purchase needs including ballot boxes, sign holders, lecterns, stanchions, trade show displays and literature stands. Over thousands of products are in stock and ready to ship to you. We have been producing and shipping pop products since 1974!! Orders can be quickly placed from our website or over the phone. Our staff is waiting for your order. In addition, our design sales team can quote and prototype your custom sample requests in hours not days. Start shopping today!